Dallying In The Dirt, Issue #284 - The forced daffodils brighten up the whole house and my outlook. The weather outside is frightful or at least confusing. We have already hit +16C (61F) in February and then a few days later it’s freezing again. No snow but lots of rain. It’s enough to make this skiing gardener throw up his hands in despair. What season is it? Inside the house we ignore the weather and follow the calendar. The Begonia seedlings are thriving and the Onions have been sown. 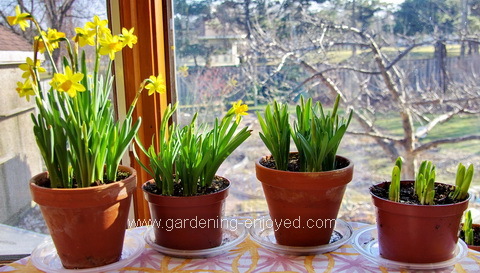 Every week I wander into the cold room and bring out another couple of pots of the minature Daffodils that we potted up in the fall. They are such a beautiful, bright yellow reminder that the real spring season cannot be too far away. Giving one of these pots to neighbours and friends is like giving them a pot of sunshine and joy. That cold room holds what’s left of the Potato crop, a few bottles of wine and some Onions and Garlic but it’s the ability to force bulbs that makes that room worthwhile. The Witch Hazel and the Snowdrops are starting to bloom in the back yard. Early Snowdrops we have seen before but I think this is the earliest that we have seen the blooms opening on the Witch Hazel. Will the veggie garden be ready to plant before the little plants are ready for it. Some seeds require a little extra effort to get them to germinate readily. Sweet Peas belong in that group. They have a very hard seed coat that takes a long time to break down and absorb water. We can hurry that process with a little scarification. The key is at the front of that fancy horticultural term, scar. In the picture the seeds are sitting between two folds of sandpaper. I put them there and then with a little pressure, roll them back and forth until the seed coat has been scratched up. This simple trick will allow the water in much more quickly and have my Sweet Pea seeds germinating in a few days instead of weeks. The several packets of seeds from my newly discovered purveyor of Oriental vegetables have arrived and the packets have a generous supply of seeds in them. 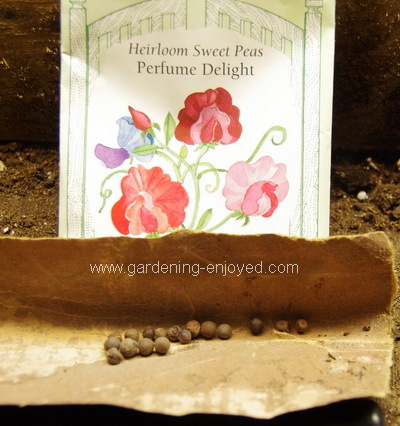 I will be sowing them next week so that they may have 6 - 8 weeks to develop before they make it into the garden. It’s always exciting to find new varieties of vegetables to add to our dinner plates and it’s equally interesting to see if we can successfully grow them. It’s part of my job to keep my readers current with the latest trends in gardening. I often note those trends and then plant the tried and true. Everywhere I traveled this past year I saw more and more succulents. There seems to be endless new varieties of these interesting plants, many of which are smaller types that can be easily used in containers. The theory being that people are too rushed to spend much time in the garden so lets give them something that requires little care and infrequent watering. Succulents appear to fit that description. Most of the containers I saw planted, as examples, are like the one in the picture. Several different varieties to add texture and colour differences and planted close together to give a finished look the day after planting. 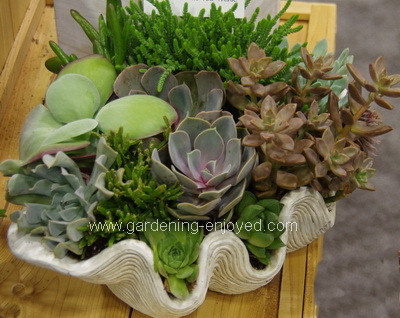 Many of these succulents are slow growing so they need to be planted close or the container will never look full. These containers will be happy in full sun but will also actually do very well in some limited shade as well. I was in the garden centre yesterday and watched a young woman, ignoring her companion’s advice, stroke some of the succulents to see what they felt like. She will eventually get all the spines from the Opuntia Cactus out of her finger and she may listen to her friends next time. They do have a bit of a soft fuzzy appearance but that is deceiving. These succulent gardens are interesting and we older gardeners can only hope they are a gateway drug that will eventually lead their owners deeper into the therapeutic joys of gardening. Now it’s time to answer a few of my reader’s questions. To ask a question just “reply” to this ezine. Don’t forget to check the front page of the Website for frequent short ideas for current gardening activities. Teresa Asks? I've been researching raised gardens and plan to build my own 4x8 ft. bed. I like the idea of cedar untreated timbers which don't require assembly or fancy cutting. I plan to fill it with vermiculite, compost and peat. Ken Answers!That’s a good plan. Do use untreated cedar. The pressure treated wood that is sold for decks etc. will leach chemicals into the soil that will inhibit plant growth. Vivian Ask? I too have amazing geraniums growing under my fluorescent lights in my basement. As much as I love seeing red or white blooms, I sadly removed them to make my plants stronger. My next job is to prune them to make more, as they are getting higher and looking very healthy. So, should I root the new cuttings in water first, or just dust them with rooting hormone and just plant them in fresh soil???? Ken Answers! I just cut my Geraniums and stick them directly into the my usual soiless mix with a bit of rooting hormone. I keep a clear plastic cover over them for a week or so to keep the humidity high, that stops them from wilting.